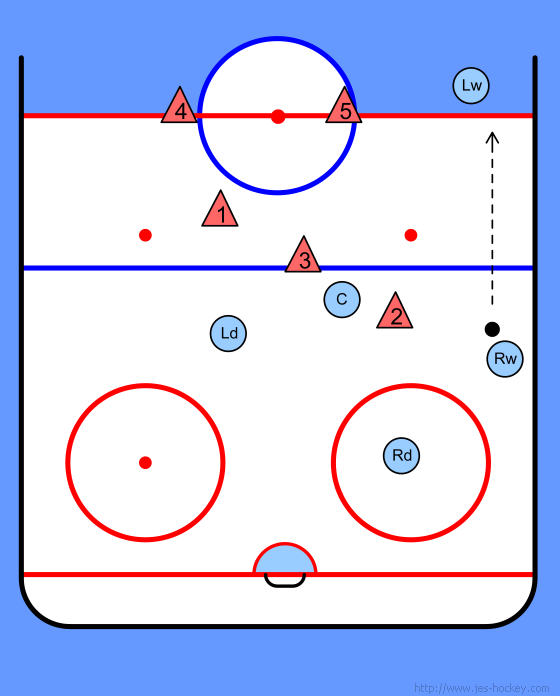 2) NEVER pass ahead across the Valley of Doom; if all options on your OWN side of the ice are unavailable, GO BACKWARDS, NEVER ahead & across. As Opponents team retreats, our wings race to half boards in prep for breakout. C comes down slot towards goal to be available. LD will pass behind net to RD to get puck away from pressure. Anticipating a breakout away from pressure (to our right), C expects to curve across front of goal mirroring movement of RD. RD will have 2 options: up the middle to C, or to RW. 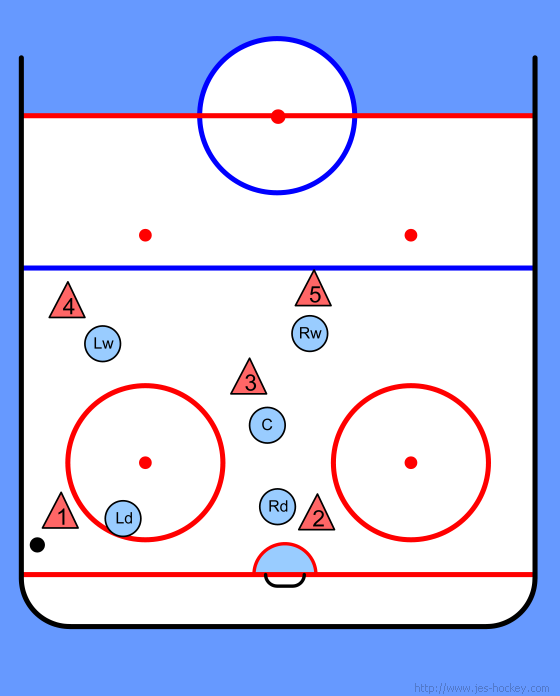 Seeing that the play is moving to the right, our LW (weak side winger) will start a diagonal sprint across neutral zone to far RIGHT blue line. This crossing movement will allow the weak-side winger to pass through several open passing lanes rather than remaining isolated and unavailable on the left side. D should watch where Opponent fore-checker #2 is going. 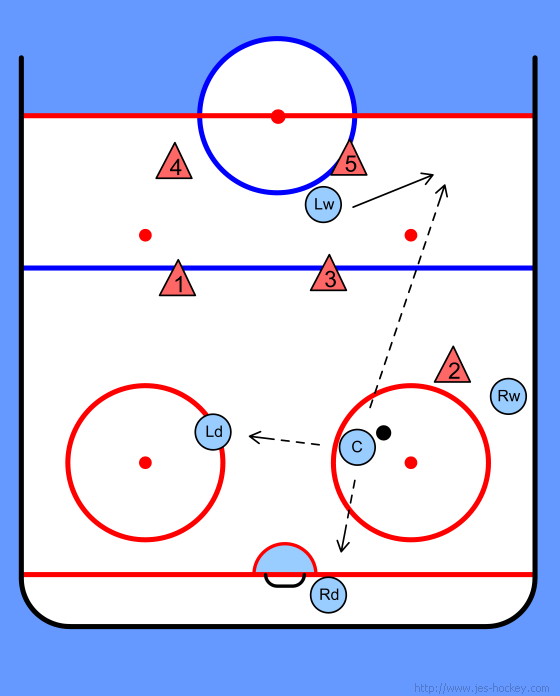 If fore-checking is heavy, reversing direction to LD is an option too. 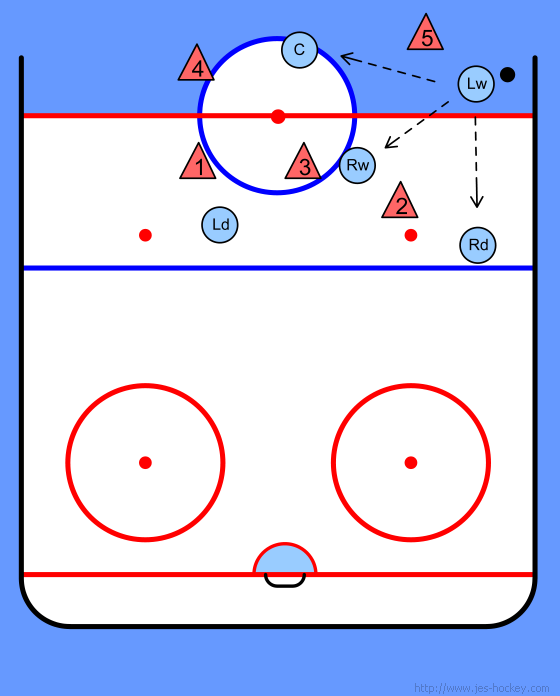 Notice that our cross-sprinting LW is not available yet, but will be passing through good passing lanes (shaded boxes) once the puck is up towards the blue line. If she had just gone straight up the left boards, she would never have been available without a DANGEROUS cross-ice pass through the Valley of Doom in the defensive zone. Opponent #2 went after RW on boards, so D passed ahead to center. 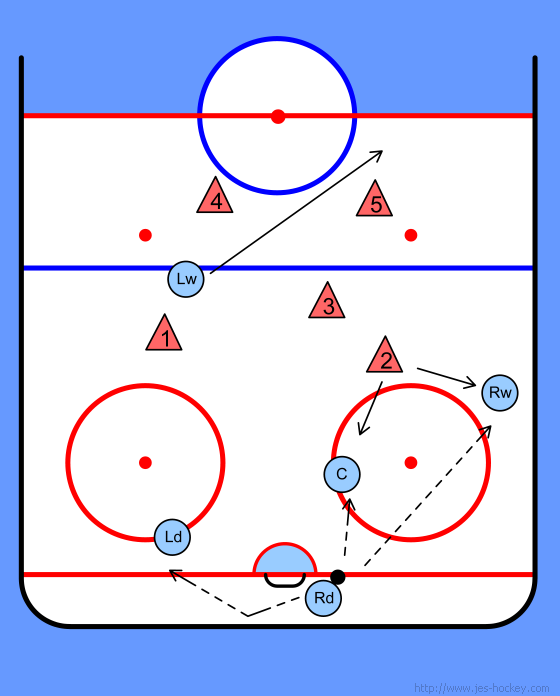 C has several options, including possible long breakout pass to LW crossing to right boards if passing lane is open. RD NEVER passes ahead to LD across slot. 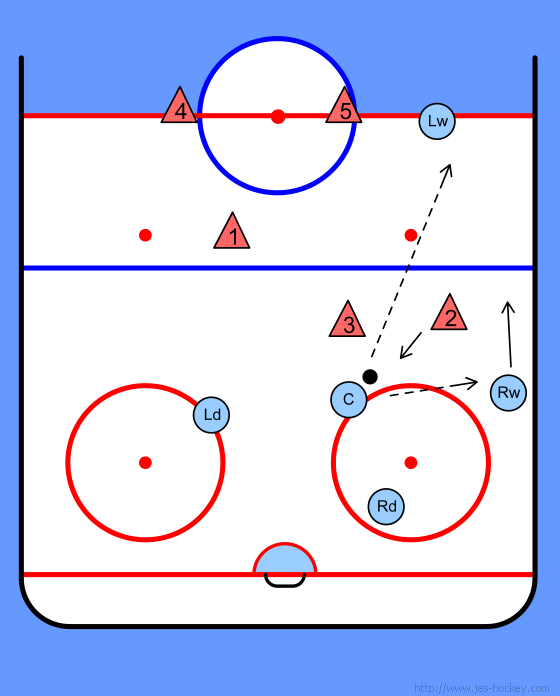 If heavy fore-checking pressure comes in, AND the puck has been moved up to top of face-off circle, C or RD can pass BACKWARDS TO LD. 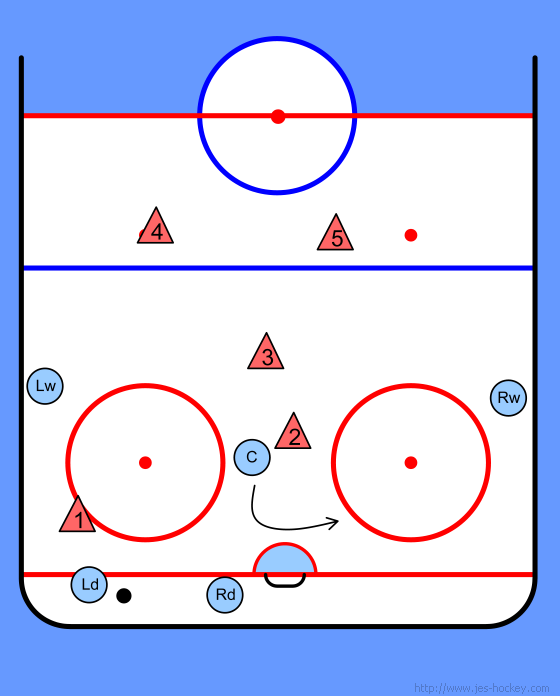 As Opponents fore-checkers converge on our C, she chooses to push puck to boards for RW. Again, if passing lanes get shut down too quickly, notice that passing back or left to D is still available. RD is better option than LD. RW has space but sees LW ahead along right boards, so she makes the headman pass. 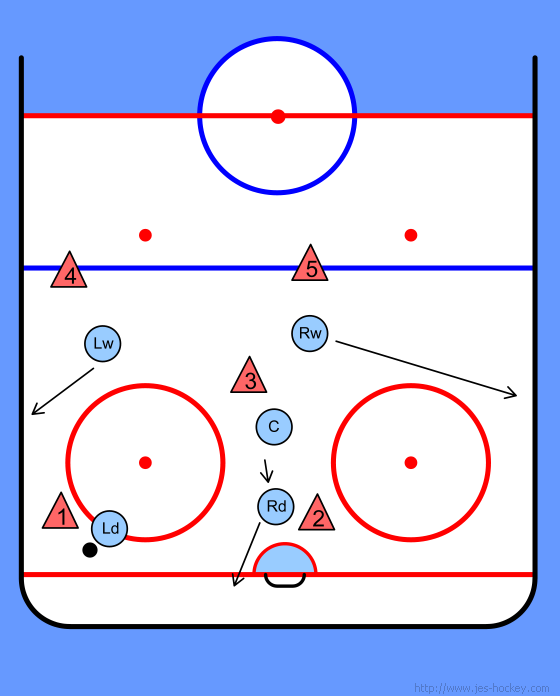 C and RW begin moves to support puck carrier, driving to hi & lo slot while LW carries puck in along right boards. 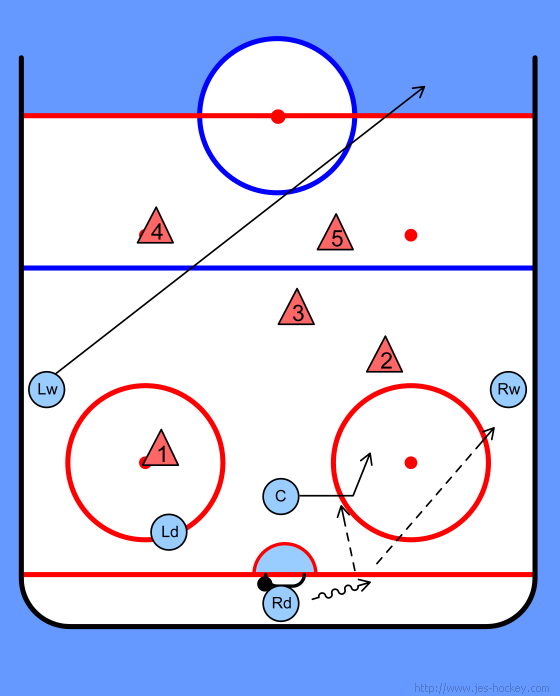 As forwards are weaving to enter zone, RD also moves along boards to become available to LW. Notice that weak side LD stays INSIDE the face-off dots, in good position to cut back and towards center in case of a turnover.